I recently partnered with the guys at Ashbury instruments. I’ve been playing the Tenor guitar as part of myself and Ross’ gig since the release of Symbiosis. It’s become an important weapon in my arsenal. I was first introduced to Ashbury Tenor guitars by Duncan lyall. He had one on loan from the mighty Damien o’ Kane. I remember playing it and falling in love with the sound immediately. The model was made from Sapele wood. It had a really rich, warm sound. The treble didn’t jump out. It was really smooth. 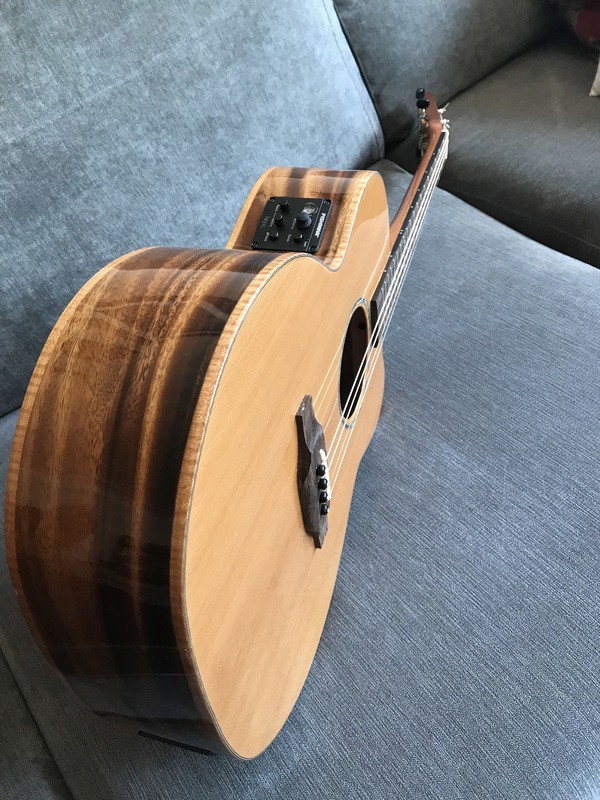 Great for strumming and picking. I recorded Symbiosis with this model, and have been gigging it (courtesy of Andrea Gobbi) ever since. So I decided to approach Ashbury about an endorsement deal. The guys were very kind and agreed to partnering up. This was brilliant news. It’s really rewarding forming these relationships and promoting people’s instruments. If you believe in the product, it’s very beneficial to both parties. People ask about your instruments all the time at gigs. Why not point them in the direction of instrument makers that you’ve developed a relationship with?!? Adam, at Hobgoblin, advised me to go for the Lindisfarne model. 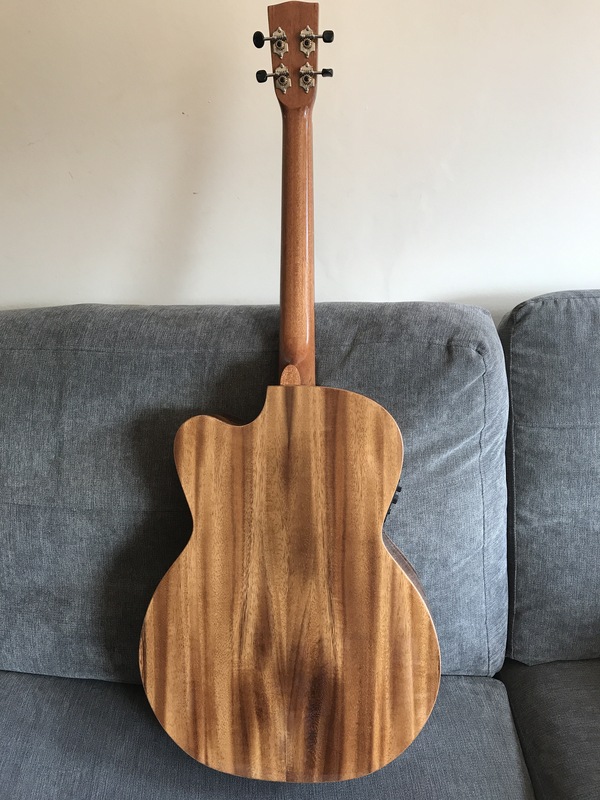 It has a solid cedar top, and Koa back and sides. It also comes with a built in fishman pickup, which I’m yet to road test. 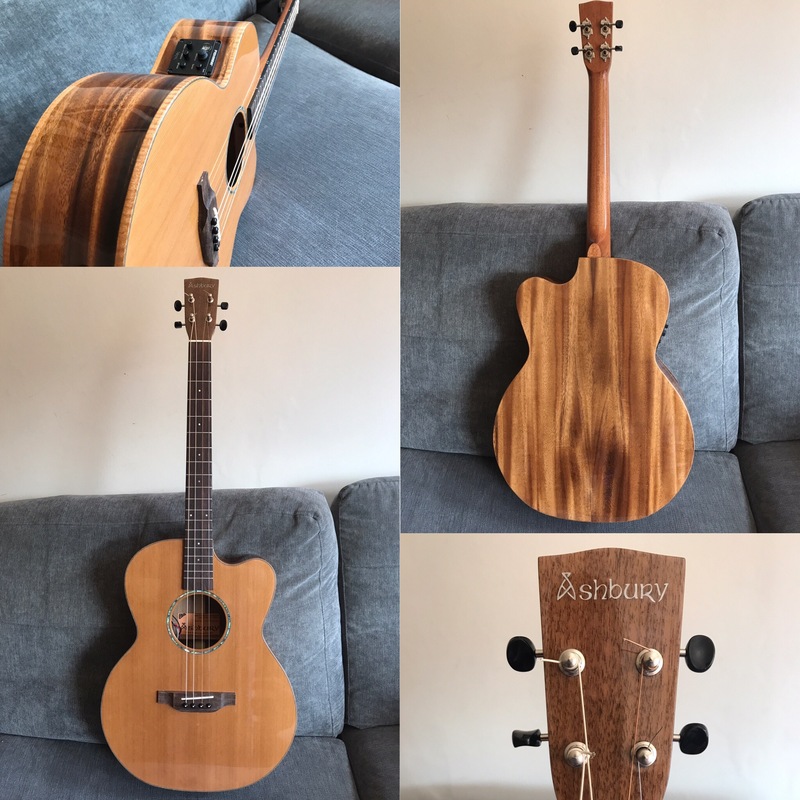 It’s has a brighter sound than the Sapele model, but it’s just as lovely sounding. It projects the sound far better because of this more present top end. This increase in treble is obviously to do with the type of wood and finish. It’s a very beautiful sounding instrument. It looks stunning too! 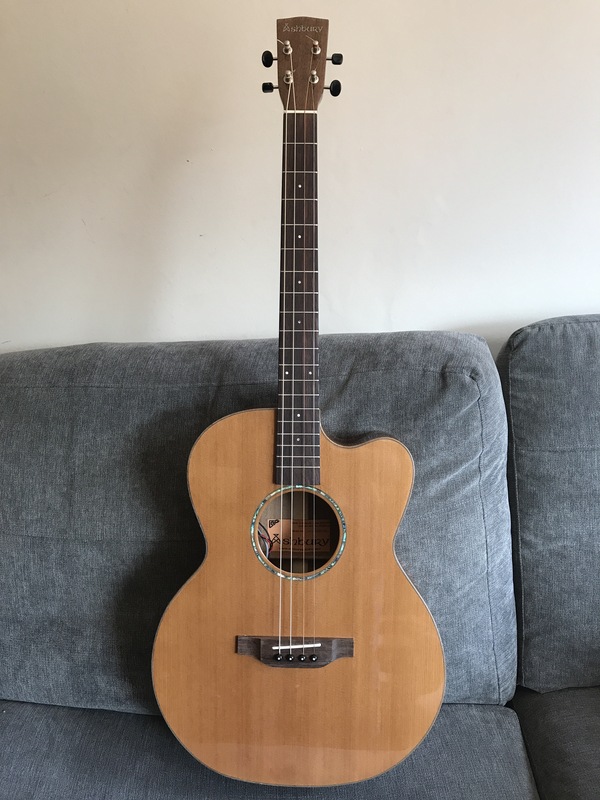 If you’re looking for a great sounding tenor guitar, for a reasonable price. I would highly recommended either of these models. I received this today from the bearded god, Gus Sicard!! 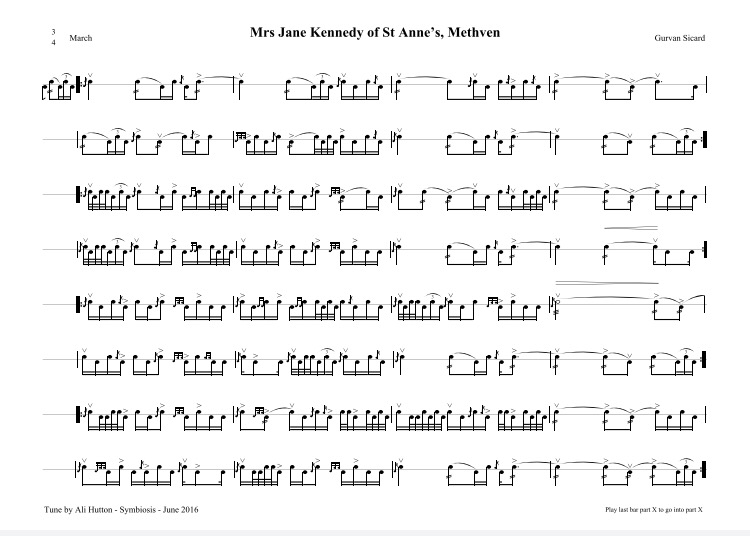 It’s the drum score that he so kindly wrote to accompany my Grans tune. It’s a beautiful thing. It really means a lot to me that he took time to do this. You can hear him playing this on myself and Ross’ album, Symbiosis! Thanks man!!! So, as I re read my post on A Highland pipes, I realise it might have implied that there aren’t many good makers out there………this isn’t true. 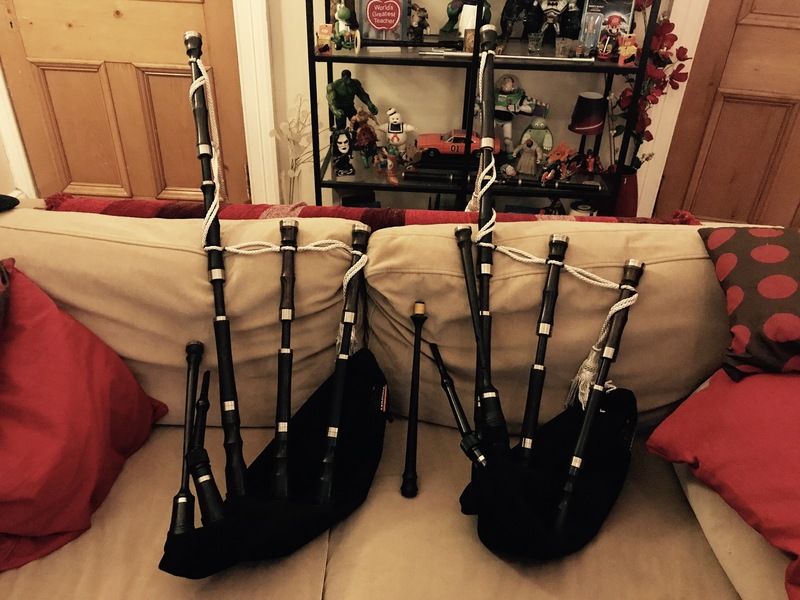 There are several great makers of all kinds of non conventional bagpipes. I’ve been very fortunate over the years to have had the support and friendship of a maker in particular, Nigel Richard. I have played Garvie border pipes for years now and still support Nigel. They have served me very well. He’s also someone that has been very kind, and patient throughout my development and growth as a musician. His bellows blown pipes are among the best. I’m very grateful for his friendship and support, and many emergency appointments along the way. Nigel is on a list of some very fine pipe makers. There are several makers now that make fine instruments to a very high standard. I believe the choice you make is based on taste, sound, and playability. You can rely on Garvie, Burgess, Moore and Macallum for instruments that perform at a professional level. They all make a wide range of bagpipes. My personal choice is to work with Garvie and Burgess bagpipes. I believe that they make instruments to suit my needs and specifications. They are also very interested on a personal level. So……….check these guys out. As I said, it really all boils down to what sounds good to your ear. All of these makers have a very distinct sound, and design. Have a look and make your own mind up!!! My frustration with Border pipes is something that has developed over the last few years. I love the sound of borders, and their ability to consistently play chromatic notes, enabling for navigation round more complex music. The overall functionality, and practicality of borders are what drove me back on the hunt for A highland pipes. If you play more instruments than just pipes on a gig, you may find that there are logistical issues with borders that can be restricting. The problems I’ve been finding recently are the constant strapping, and unstrapping of bellows. This consumes a massive amount of time during a gig, and causes unnecessary distraction. Especially when going between instruments. If you don’t want to play whistle whilst remaining strapped to your bellows then you must build in time within the musical arrangements to allow for a smooth changeover. This can be detrimental to the shape, and dynamics of the music. I’ve also found recently that doing full gigs with bellows, in fact doing month long tours can be very tiring on the arm. This sometimes causing discomfort to my right hand. One of the other reasons I’ve moved away from using borders is that if anything goes wrong with them when you’re far from home, they’re not easy to pick up supplies for. The chanter reeds are not commonly found globally. 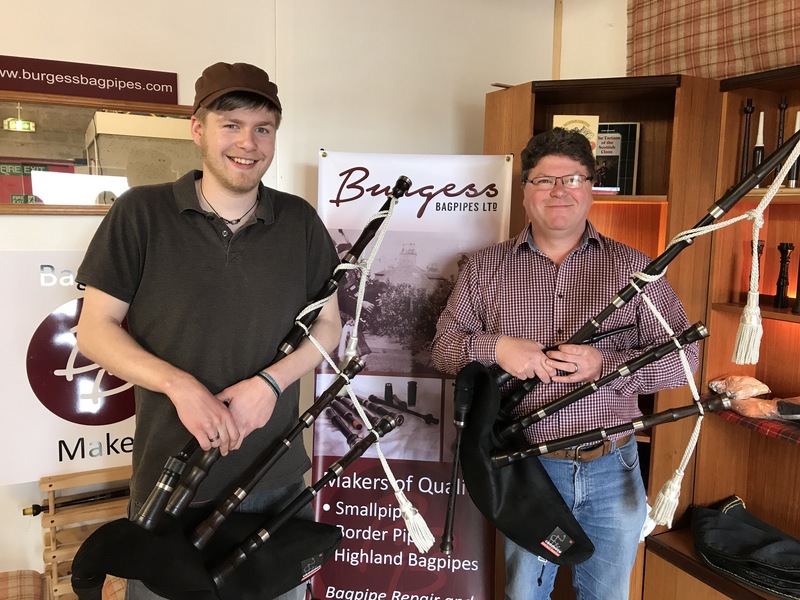 It’s much easier to find highland bagpipe supplies most places these days, especially in the US and Canada (unless Trump takes a disliking to the pipes next). So, I decided to pursue the elusive A highland bagpipe. This isnt made by many bagpipe makers. It is however catching on at the moment because of the interest shown by pipers performing outwith pipe band, and competitive circles. There aren’t many companies making and developing these pipes. 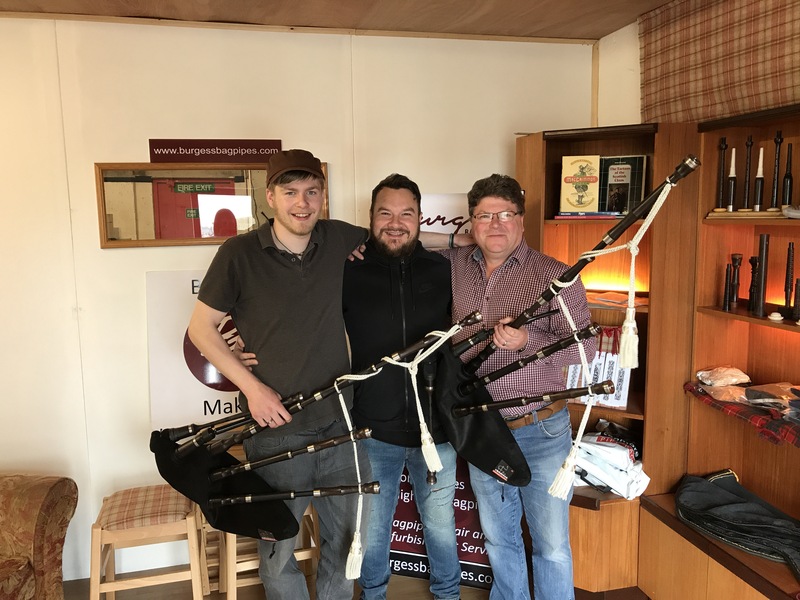 At last years piping live I met a father and son, Burgess and Scott, who were very new to the bagpipe making business. They are the loveliest of folk, and are very enthusiastic about the making and development of bagpipes. Their company name is Burgess Bagpipes. This is a two man, family run operation based in Forres. These guys are incredible. For such a new company, the quality of their instruments are of a very high standard. 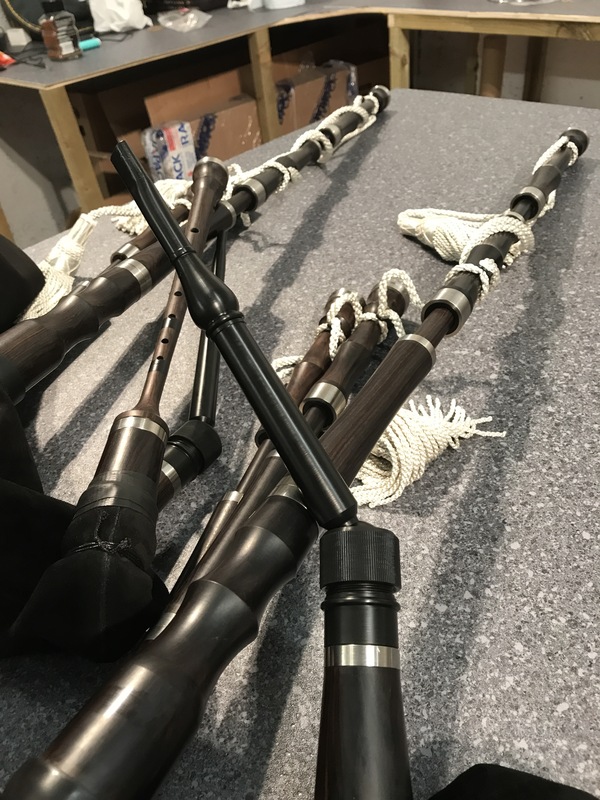 The build is quality, the look is unique, and the sound rivals any of the other top modern bagpipe makers. Their border pipes in particular sound amazing. Made from the finest Blackwood, with titanium mounts. The tuning is spot on, and fully chromatic. They have a very sweet, direct sound. Over the last year or so I’ve become pals with these guys. They’ve been very supportive of my career and I’m very grateful for that. They were very understanding when I moaned about my recent border pipe issues. I mentioned to them that I was very keen on getting A highlands but that there weren’t really many good solid builds out there. This is something that they had been thinking about for sometime also. So, they set to work, becoming intensely involved in the development of these pipes. Which when you run a company based on making instruments to order, this can be a bit of a distraction. But, definitely a distraction that is going to pay off! After several months of research and development, the guys have made a couple of sets. I travelled to Forres yesterday to pick them up for myself and Ross to try! I have to say, they are sounding great. The drones are steady, the chanter volume is well balanced against the drones, they have a nice highland pipe sound, without being too loud. There are a few tweaks here and there but watch this space. These are going to be a necessity for any piper who plays with other instruments. Here are a few pics from the visit…..
Hi there. 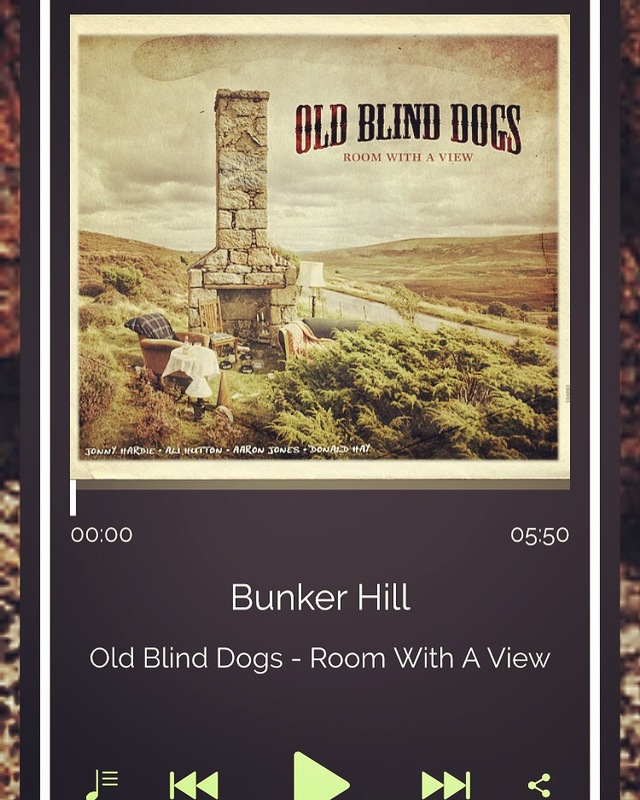 The new album from Old Blind Dogs is available to buy via our new website. The album showcases Scottish tunes and songs, both new and old! Also featured is the newest member of the doghouse, Proffesor Donald ‘Drummy’ Hay! So come and grab your copy. Get swinging yersels aboot the hoose! !